← Institutions & Insurance:: physician heal thyself…but do it quick! We continue to be limited by our own knowledge, thus, invite disaster. We prefer faux certainty (a projection of the future based upon our past) to the reality of uncertainty and, as a result, when disaster strikes, we are prone to “label” what was unforeseen as unforeseeable…that suggests that we have looked but did not see! When, too often, the truth is that we didn’t look but assumed. Or “overlooked” by failing to utilise the tools available to us. Even when great care is taken, by ‘enlightened leaders’, to structure the most effective enterprise, the task of monitoring let alone maintaining a resilient operation is far from straightforward…it is, undeniably, highly complex! 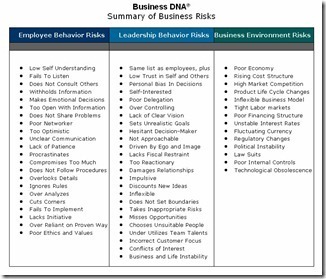 Business and risk management efforts intended to deliver financial performance within ‘safe’ parameters are, like the multi-layered, mixed, simultaneous or conflicting ‘risk decisions’, subject to, ‘bounded rationality’, cognitive biases, self-interest or silo-mentalities… All this ‘noise’ can drown out the signals [internal and from the business’ ecosystem] that are required for a healthy system. When we understand that EVERY complex system is dynamic [no single equilibrium] and that it adapts to interact with its environment we begin to appreciate that, we may influence but CANNOT ‘manage’ a system that is vastly more complex and fast-acting than the capabilities of conventional tools and techniques. This is why we make do with trying to predict the unpredictable, buying protection [insurance risk transfer] and reacting after-the-event to try to prevent the recurrence of a negative outcome or try to repeat the process that led to a positive outcome. Journalist William Langewiesche, who specializes in deconstructing accidents, says that there are three kinds of accidents. • “Procedural” accidents, in which someone makes a mistake — as when pilot error causes plane crash. • “Engineered” accidents, in which materials or structures fail in ways that should have been foreseen by designers and engineers. Among those “riskiest technologies” are the air transportation system, nuclear power plants, aircraft carriers and, as we now know, deep-water oil drilling. We accept the risks they entail because we like the rewards they provide. In Parts 1 & 2 I referred to the dangers associated with the use of intuition or deployment of the wrong tools in, well intentioned, efforts to rectify problems or to avoid damage or loss…but, that amounts to treating the symptoms of something(s) lying deeper within the system.